You have distinct financial issues that deserve creative solutions. 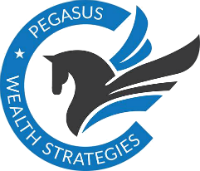 Rather than attempt to solve your own wealth management quandaries, enlist the experienced services of Pegasus Wealth Strategies. Our advisors craft financial plans that are personalized, strategy-oriented, and aimed at helping you pursue your goals. Specializing in comprehensive tax saving strategies, our firm helps individuals aspire to save above and beyond their traditional IRA, 401K, and Profit sharing Plans. We believe that the money you keep is just as important as the money you make. Our savings-focused tax planning service is one of the most sought after offerings that we provide, Executive Life Income Planning for Doctors, Lawyers and Executives Above and beyond their 401K and Profit sharing Plans. Along with specialized tax planning strategies, Pegasus Wealth Strategies is proud to offer a full suite of creative wealth management strategic services. No matter what your financial situation demands, our team of experienced professional advisors are well-equipped to deliver objective advice, outstanding service, and sophisticated strategies to help you pursue your wealth goals. Assisting clients in all areas of personal wealth, we are devoted to instilling confidence today, tomorrow, and well into the future.